Hey party peeps! Fairy parties are still one of the most popular party themes for little girls and today I’m sharing over on Oriental Trading’s blog LOTS of RAINBOW FAIRY PARTY IDEAS! My daughter loves fairies and rainbows so this party theme seemed the perfect twist on the traditional fairy party which usually has lots of pastel colors. Not this girl! We are embracing all the bright and brilliant colors of the rainbow and pairing it with bright white to give it a modern feel. Hop over to my post on Oriental Trading here for complete with step-by-step instructions and a full shopping list to recreate this party on your own easily and AFFORDABLY! GIRLFRIEND TIP: That amazing table centerpiece is actually a hanging rainbow chandelier from my daughter’s room that I placed on top of a candle stick from my dining room table which created such a fabulous RAINBOW CHANDELIER CENTERPIECE! Use what you have! – DIY FAIRY PIXIE DUST BOTTLES & DRESS UP BAR! – HOW TO MAKE FAIRY WING CHAIRBACKERS! – MY LITTLE PONY RAINBOW PARTY! – MY LITTLE PONY RAINBOW PARTY CANDY BUFFET! WANT MORE PARTY INSPIRATION? FOLLOW ME ON PINTEREST & SUBSCRIBE TO MY BLOG! CLICK HERE to check out my Pinterest Board for LOTS of inspiration and ideas. Want to get more of my “Girlfriend Tips” and party inspiration? Be sure to SUBSCRIBE to my blog so you can get all my blog posts delivered right to your email’s inbox so you won’t miss a thing! Subscribing is easy! Just enter your email address in the above right corner of this page and be sure to confirm your email once you get our confirmation to your inbox! That’s it! AND…you’ll get a code for 10% off your next order in our shop. This is such a cute girls party idea. I am sure my nieces would LOVE this. Oh mu gosh I lvoe this. That centerpiece is to die for it’s so pretty. This looks like a great party idea! I need to show this to my daughter as a possibility for her next birthday party. I love your party ideas. Any girl would love this set up! This would be a fun end of the school year party for the girls. Jessica is big on singing the rainbow song so this would be perfect! It looks like a great party idea! You’ve made wish I had a girl! Love it! This is so fun! Makes me think of my Rainbow Bright doll I loved so much. My daughter would LOVE this. Just today we were in Walmart and she was talking about getting something rainbow. This might be my idea for her 5th birthday. I do love a rainbow theme. It can be done with such class and you hit a homerun once again. I love the lamp! I am loving that centerpiece idea – what a statement it makes on the table! It is a smart idea to use what you have. Decorations can really dent the bank if you are going all out to buy new. Everything here looks great. The chandelier idea is cute. I absolutely can’t wait. My daughter is obsessed with rainbows and fairies, and reads all those Rainbow Fairy books in the series. Heading over! So colorful and pretty. I wouldn’t even wait for a party to have an excuse to inject some color and whimsy in my life. My girls would love to add these beatiful deciorations to are next party.So cool. I want to have a party just so I can do this. I love all the bright colors. I really like that centerpiece. The way it drips the colors is awesome! Rainbow is so in these days, from hair to clothes and now to party decor as well! I love the splash of color and it will make any party full of life! Whoa! These pictures you showed were incredibly amazing! You have an amazing creative skills to decorate this party! I do not have any daughters, I wish that I have one little girl. Thank you for sharing. I want a party of this concept, great idea! I/m sure that my kiddo will going to love this! Those are some incredibly colorful designs! That rainbow chandelier just made its way to my wishlist! I love your idea, this would be great for my son’s birthday party and I’m hoping that he’s going to like it! Love this idea, it is so girly! Keep on posting themed ideas that are great for parties! Super CUTE!! I always love looking at your party ideas, you are very creative!! I like to plan my own kids’ parties, but it pales in comparison to your parties! BUT, love to look at your ideas! This is such a great idea. My daughters would love a party like this. All the colors really stand out too. I love it! Now that makes a party statement! I’d like to have one on my desk just to make me smile! Oh my gosh, this is such a fun party idea! Love the colors! 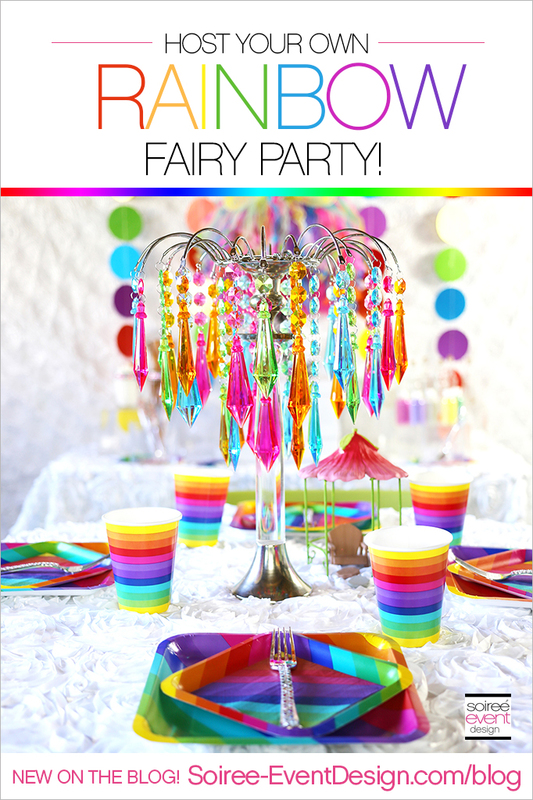 Oooh a rainbow fairy party looks like an amazing theme idea! I love the multicoloured light.